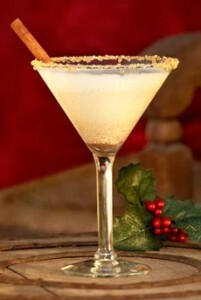 For Christmas or New Year’s Eve, how about a fun and flavorful Eggnog Martini? You can buy eggnog in the supermarket and mix multiple portions in a pitcher. 1. FILL a 5-ounce Martini glass with ice to chill it. 2. COMBINE the eggnog, vanilla vodka and cinnamon liqueur in a shaker with ice, and shake to blend. 3. DISCARD the ice in the glass and strain the cocktail into it. An Eggnog Martini with a rim of crushed graham crackers. Photo courtesy Cedar Mill Liquor. Infusion method: Add a vanilla bean to a bottle of decent vodka. Cap tightly and let the vanilla infuse for 1-2 weeks in a cool, dark place. Gently shake the bottle every other day. Quick solution: Add vanilla extract to vodka, 1/4 teaspoon per two ounces. For a 750 ml bottle of vodka, that’s 3 teaspoons. Shake well to blend. Some brands are meant to burn like Red Hots candy. You want something more elegant. 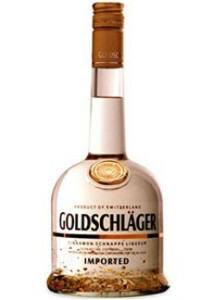 Our favorite is Goldschläger cinnamon schnaps with gold flakes. It looks magical in shots and clear cocktails. So what’s the difference between cordial, eau de vie, liqueur and schnapps? While many people use these terms interchangeably, and they are all flavored spirits, there are differences in terms of sweetness and color. In sum: If you want a less sweet, clear spirit, choose schnapps/eau de vie over liqueur. For something sweet and syrupy, go for liqueur/cordial. Liqueur is sweeter, and made from a grain-based alcohol.